I love soup, so I’m really excited to be sharing with you some of my favourite soup recipes. When you eat a really good bowl of soup, you feel good and you know you’re being healthy too. If you are looking to lose weight or keep the weight off, have a bowl of soup prior to your meals. It has been proven to control hunger, resulting in you eating about 20% less for your meals. For those of you who do not like to eat your veggies, soup is also a great way to add vegetables into your diet. Here are 3 of my favourite holiday season soup recipes. They are so delicious, filling, low in calories, easy to prep and made only with wholesome ingredients. *Option: Butternut Squash or any other winter squashes. 1) In a large pot, heat olive oil over medium heat. Stir in the garlic, ginger and onion for 1 to 2 minute until slightly brown and fragrant. 2) Add in all the spices; curry powder, cumin, turmeric and coriander. Continue to stir for about 1 minute until spices become toasted and fragrant. 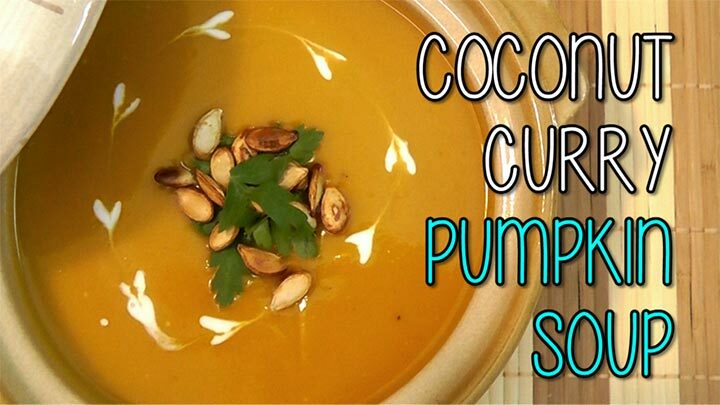 3) Then add in the pumpkin, vegetable stock and coconut milk. Bring to a boil, cover and simmer for about 10 minutes until pumpkin is tender. 4) Turn of the heat and puree all the ingredients with a hand blender until smooth. 5) Season with lemon, salt & pepper. Serve hot. I’ve garnished my Coconut Curry Pumpkin soup with pumpkin seeds and fresh parsley. 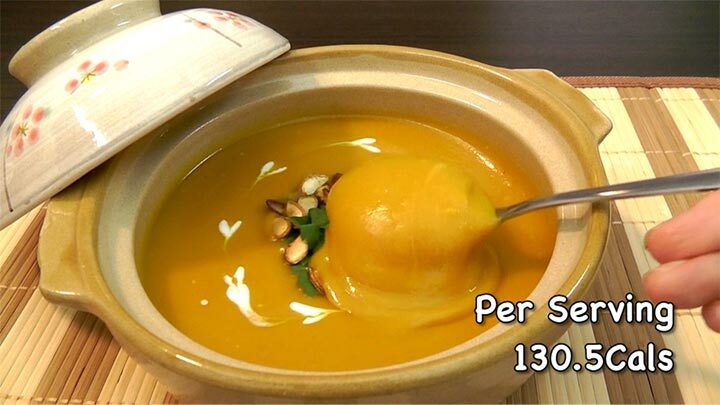 The bowl of soup is pack with flavours. The richness from the coconut milk and the slight hint of spiciness from the curry powder makes it a soul warming dish. Winter squashes are also a great way to thicken your soup without adding many calories. This one large serving only has 130Cals. Be sure to include this recipe for Christmas or New Year. 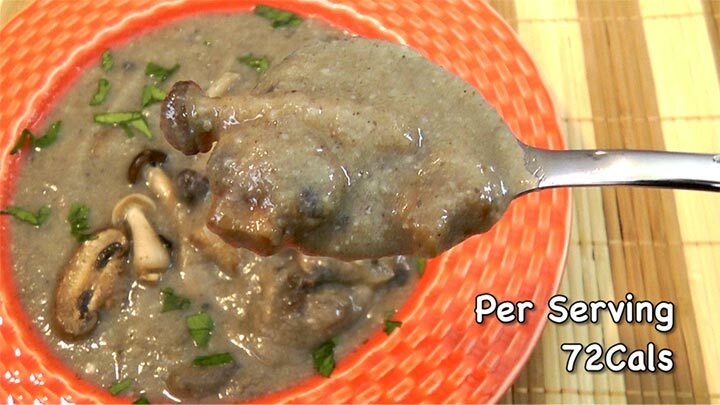 The next recipe is the queen of comfort food, Creamy Mushroom Soup. The deep earthy flavor is so soothing and hearty. 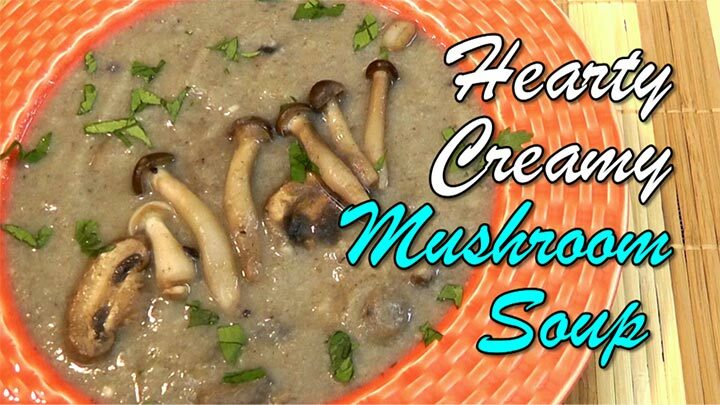 The classic mushroom soup recipe tends to call for a lot of heavy cream and can be packed with hidden calories. For my recipe, we’re going to give it a slight twist and cook it without cream, yet still maintaining its classic flavor. 1) In a large pot, add 2 cups of vegetable stock and cauliflower. Bring to a boil, cover and simmer for about 10 minutes until cauliflower is very tender. Puree with a hand blender until smooth and set aside. 2) In a pan, heat olive oil over medium high heat. Stir in garlic, onion and mushroom. Sautee from 5 – 7 minutes until onion and garlic are golden brown and fragrant and mushrooms are cooked through. 3) Add ¾ of the sautéed ingredients and the remaining 2 cups of water into the pureed cauliflower. Bring to a boil, cover and simmer for 5 minutes, until slightly thickened. Turn off the heat, Puree all the ingredients with a hand blender until smooth. 4) Then stir in the remaining sauteed mushrooms, and season with lemon, salt and pepper. Serve hot. So the secret ‘creamy’ ingredient is to add pureed cauliflower into the mix. 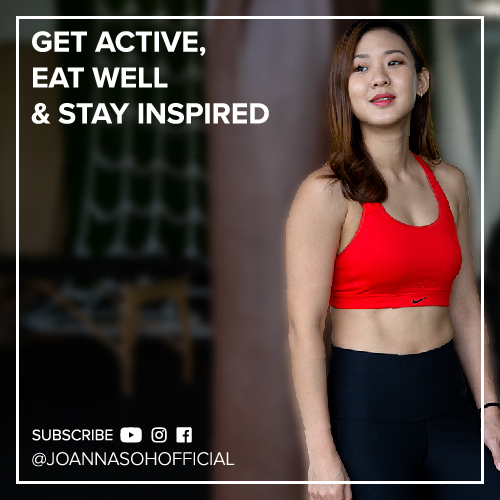 It’s an extremely good source of fiber, which means keeping you full for much longer and it’s also very low in calories, with only 72Cals per serving. You don’t need a reason to enjoy a hearty bowl of Mushroom soup. I like to have it throughout the year. 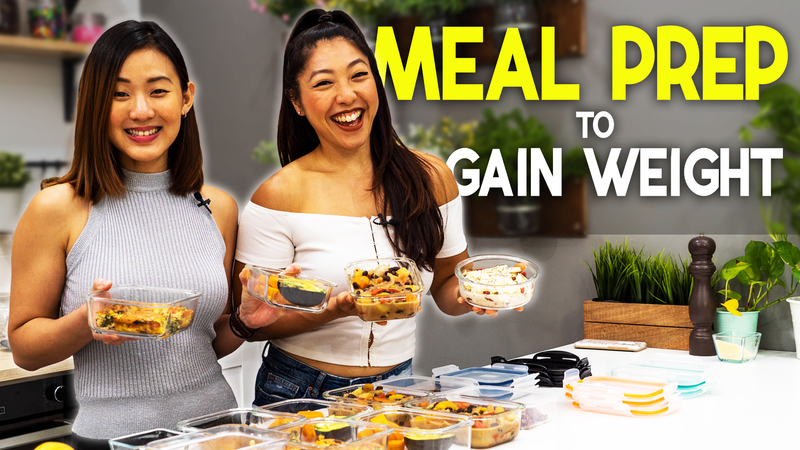 You have to give this healthier recipe a try! 1) In a large pot, heat olive oil over medium heat. 2) Add garlic and onion and stir-fry very quickly until slightly brown and fragrant. 3) Mix in the sweet potato, black beans and all the spices. 4) Then add the vegetable stock. Bring to a boil, cover and simmer for 15 – 20 minutes until sweet potatoes are tender and cooked through. Turn off the gas or heat. 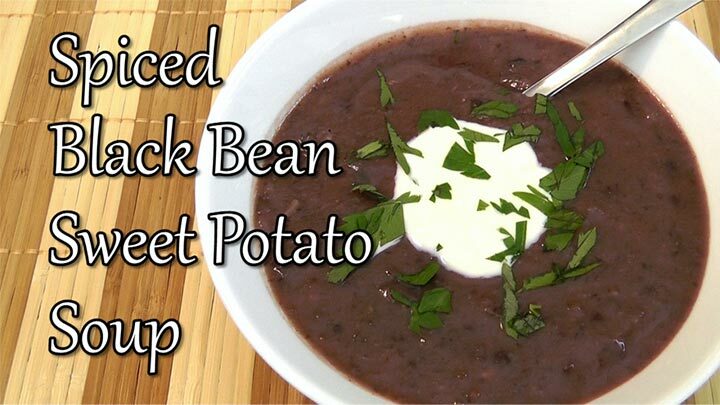 5) Using a soup ladle, scoop out about one cup of sweet potatoes and black beans and set aside. Puree the rest of the ingredients with a hand blender. 6) Turn the heat back on to low and add back in the reserved sweet potatoes and black beans. Season with salt & pepper and cook very quickly for about 5 minutes just to heat the soup up. This bowl of soup is bursting with flavours and is high in fiber and protein, which makes it a very satisfying meal. Remember good food doesn’t mean complicated ingredients, keep it simple and wholesome to bring out the flavours of each ingredient. 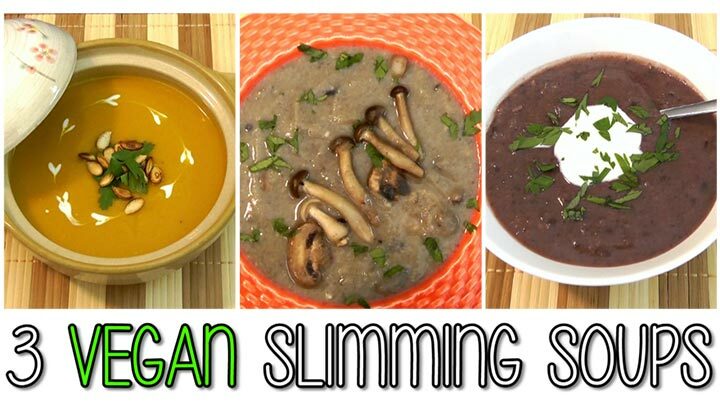 So to avoid overindulging during holiday season and to keep the weight, include soups into your meals. Serve it as a starter for lunch or dinner or have it as an afternoon snack. They are extremely convenient and easy to make in large batches ahead of time, which also makes it a perfect dish for parties.